All the users of unlocked and US Cellular variants of the LG V30/ V30+ will be happy after listing this amazing news. If you are the owner of US Cellular variants then now you can install Android Oreo on Unlocked LG V30/V30+. The LG V30 smartphone was launched in August 2017 and comes with a 6.00-inch touchscreen display with a resolution of 1440 pixels by 2880 pixels. The device is powered by 1.7 GHz octa-core Qualcomm Snapdragon 835 processor along with 4 GB of RAM and 64 GB of internal storage. The LG V30 runs Android 7.1.2 Nougat OS out of the box. Now the time to install Android Oreo on Unlocked LG V30/V30+. We share a detailed and easy guide on how to download and install Android Oreo on Unlocked LG V30/V30+. If you are the owner of Unlocked LG V30/V30+ and still using the Android 7.1.2 Nougat then you must give a try for the new baked sweet of Android known as Android Oreo. The Android Oreo official update comes with tons of new features such as Picture-in-Picture mode; faster boot time, adaptive icons, background limits, Android Instant App compatibility, Auto-fill and much more. The Android Oreo official firmware comes with build id number OPR1.170623.026 along with latest security patch for bug fixes and other issues. Given below we share an official firmware file link. 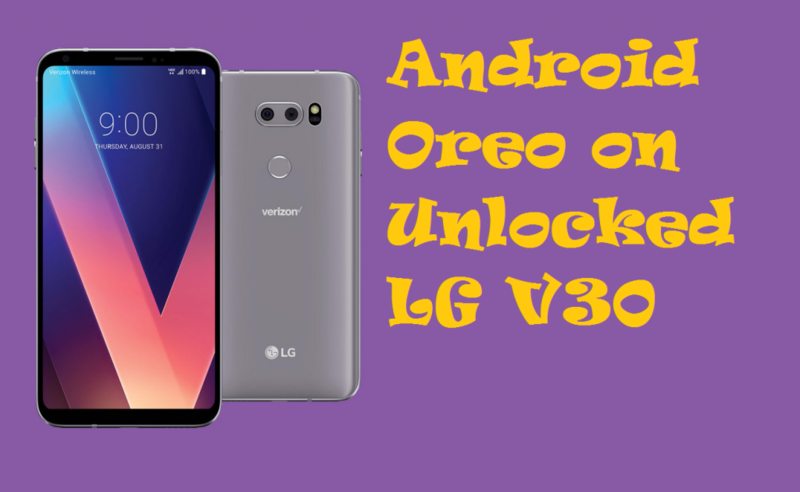 Though that you can download and install Android Oreo on Unlocked LG V30/V30+ by following given below instructions. The Android Oreo update is a stable update and smoothly runs on your device. We are advising you to update your Android device to the latest official stock firmware. While installing Oreo on Unlocked LG V30/V30+ there is no chance to lost or wiped your data, but it is better to take the backup of your phone. If you are interested in installing Android Oreo on Unlocked LG V30/V30+, then go ahead and follow the given instructions. Perform a complete backup of the existing data on LG V30/V30+. This Firmware file is only for LG V30/V30+. First of all, download the LGUP Tool and LG V30/V30+ KDZ ROM from above link and extract it. Now Install the LGUP on your PC. Once installed then Launch LG UP tool via Uppercut by double-clicking on the ‘UPPERCUT_1.0.0.0.exe’ file. Now in LGUP, click on Upgrade option choose the file’s path and locate the KDZ file (you downloaded before) and select it. Click on the Start button to start the process. Once complete then perform a factory reset (Optional). That’all! You have successfully Update LG V30/V30+.